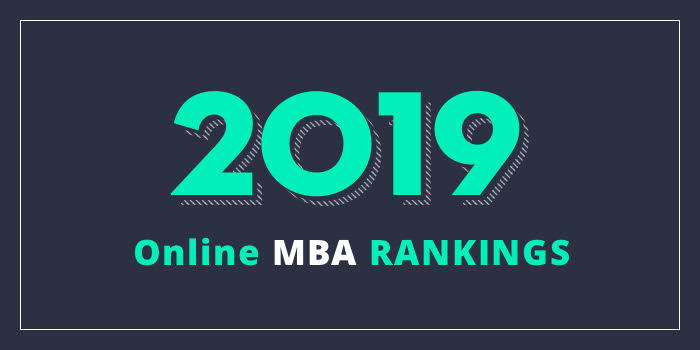 Our 2019 list of the Top 25 Private Online MBA Programs in the US. For an explanation of our ranking criteria, click here. Students will complete the program via multiple delivery methods including interactive games, virtual learning exercises, group video conferences and class sessions led by instructors, and one-on-one faculty discussions via webcam. Video content and presentations produced at the USC Marshall dedicated studio are also highlighted, as well as case studies and dramatizations of real-world business scenarios, and collaborative video activities and assessments. Other program highlights include the Personal and Leadership Development Workshop residency, which takes place at the schools’ coastal Malibu campus, Global Business Intensives, which cover relevant topics such as international economics, culture, marketing, finance, and business law, and five in-demand concentration options including Digital Innovation and Information Systems, Finance, General Management, Leadership and Managing Organizational Change, and Marketing. An optional international residency that allows students to explore global issues and work with international experts to understand foreign markets is also available. Graziadio Online MBA students can complete the program, with a concentration, in as few as 24 months. Rice University’s Jesse H. Jones Graduate School of Business offers an AACSB-accredited online MBA program known as [email protected]. Per the school, the program develops students’ understanding of “essential business principles such as financial accounting, business analytics, marketing strategy, leadership and finance.” Students will “learn to apply these larger concepts throughout an organization” as they hone their skills in a focused specialization of study. In each 11-week term, students will take courses totaling up to six credits. The first year will consist of all core courses, and the second year features a combination of core and elective courses. Sample courses include Business-Government Relations, Competitive Strategy, Corporate Investment Policy, Corporate Responsibility, Economic Environment of Business, Geopolitics of Energy, Futures and Options, Leadership, and Negotiations. Students must complete 54 total credits including 36 core credits, 12 elective credits, three credits of Residential Intensive Learning Experiences (ILEs) and three additional credits of either electives or ILEs. “ILEs consist of a variety of simulations, seminars, group projects and guided leadership exercises that bring students face to face with peers, faculty and industry leaders.” Domestic ILEs are often held on the Rice University campus in Houston, Texas. Optional International ILEs are part of the Jones Educational Global Experience (Jones EdGE) and include optional seminars, intersessions and study abroad opportunities hosted throughout the program. Students can take up to two additional ILEs in place of two 1.5-credit electives. Exams are held during the final week of each semester and the program can be completed in 24 months. Heider College of Business at Creighton University offers an MBA program that can be completed in just over two years. Three delivery options are available including completion of courses online, on campus, or a combination of the two. This 33 credit hour program offers several MBA concentrations, the option to add a graduate certificate or a dual degree in addition to the MBA. Concentrations include Accounting, Business Intelligence & Analytics, Financial Psychology & Behavioral Finance (also a certificate), Finance, Leadership, and Personal Financial Planning (also a certificate). Other certificate options include Business Analytics, Healthcare Management, Negotiation & Conflict Resolution, Organizational Leadership, and Project Management. Students can combine numerous degrees with the MBA. Just a few include MBA + Law, MBA + PharmD, MBA + MS in Investment Management & Financial Analysis. Graduates of the AACSB-accredited Heider Online MBA Program have gone on to pursue careers at numerous Fortune 500 companies such as ConAgra Foods, Mutual of Omaha, TD Ameritrade, Union Pacific, and others. Job titles of recent graduates include CEO, Finance Manager, Marketing Manager, Operations Manager, President, Project Manager, and Vice President. may be completed in as few as 12-16 months. This AACSB-accredited program highlights a “rigorous curriculum focused on principled leadership” as well as “faith-based learning,” and “powerful corporate business alliances.” Sample courses for this 48-60 credit hour program include Ethical Leadership, Managing for Higher Performance, Manufacturing and Service Operations, Managing Information Technology in the Business Enterprise, and Negotiations. Besides an accelerated pace and a rigorous curriculum, the Hankamer Online MBA has an excellent placement rate. In 2018, 95% of MBA graduates landed positions within 90 days after graduation. The Brock School of Business at Samford University offers an online MBA program that can be completed online, on-campus or a combination of the two. Concentrations are available in Entrepreneurship, Finance and Marketing and a number of joint degree options are also available. Sample joint degrees include MBA/MAcc (Master of Accountancy), MBA/MSEM (Master of Environmental Management), and MBA/MDiv (Master of Divinity). The Brock Online MBA curriculum consists of 36-45 credits, depending on previous academic experiences. Students who choose a concentration will take 39-48 credits. Course highlights include Accounting for Decision Making, Economics of Competitive Strategy, HR and Organization Management, Managing Corporate Integrity, and MIS & Communication Technology. The AACSB-accredited Brock Online MBA has three start dates including August, January, and May. Admission decisions for the program are made on a rolling basis, meaning admission decisions are made as applications are completed. The Kania School of Management (KSOM) at the University of Scranton offers a 36 credit hour Online MBA Program with optional specializations in Accounting, Enterprise Resource Planning (ERP), Finance, Healthcare Management, Human Resources, International Business, and Operations Management. A General Management MBA is available for students seeking a broader degree and Online Certificates in Supply Chain Management, Health Administration, Health Informatics and ERP are available. This AACSB-accredited program features one-on-one interaction with professors and classmates via email, online discussion, and virtual meetings. There are no required residencies, so the program and all of its components may be completed 100% online. Students can expect to complete the Online MBA Program in just two years “at a comfortable pace of one course per term.” Students also have the option to complete the program sooner by taking more than one course per term, with advisor approval. The KSOM Online MBA Program requires just three years of professional or supervisory work experience for acceptance and does not require any entrance exams like the Graduate Record Examination (GRE) or the Graduate Management Admission Test (GMAT). Concordia University in St. Paul, Minnesota (CSP) offers an online MBA that consists of 42 credit hours of study. The program also offers a flexible hybrid option that allows students to complete the degree online and evening’s on-campus. Students in either program will become experts in their chosen industry through cross-curriculum education, the exploration of business trends and events (and how they affect the current business environment), and practical experience. Also part of this program is the opportunity to participate in the Graduate Study Abroad Program (or Topics in Global Management) and the Concordia MBA Mentor and Managerial Application Portfolio (MAP). The 0-4 credit study abroad opportunity is an international travel course that supports students' program learning with first-hand experience. MAP consists of a one-credit Managerial Application Portfolio course taken in six consecutive terms for a total of six credits. Each MBA student “has a designated MBA faculty mentor to support and guide them through graduate school,” says the school. The faculty mentor acts as a personal business coach to help students develop networking strategies, polish interpersonal skills, and enhance their resume. The Concordia MBA Mentor and Managerial Application Portfolio (MAP) has contributed to CSPs excellent job placement rate. Ninety-five percent of graduates land positions within one year of graduation. Concordia University, St. Paul is a member of the Accreditation Council for Business Schools and Programs (ACBSP). Leavey School of Business at Santa Clara University offers an online MBA program that can be completed in as few as two years. Designed to help students become “Silicon Valley Professionals (SVPs),” the program highlights a curriculum based in “innovation and responsibility,” says the school. Sample courses for the program include Doing Business in Silicon Valley, Leading People and Organizations, Ethics for Managers, Strategy, Analysis, Design, and Management of Enterprise Platforms, and Marketing is Everything. The program also highlights 28 units of free electives that allow students to focus in one or more areas. The Leavey Online MBA requires two on-campus intensives, where students will meet their peers and experience Santa Clara University in person. These are the only two campus requirements. Otherwise, online students will take courses whenever and wherever, but they will learn from the same professors who teach the on-campus program. The program, including Leavey School of Business is AACSB-accredited and is currently in the process of seeking approval for the Online MBA program from its institutional accrediting body, the WASC Senior College and University Commission (WSCUC).